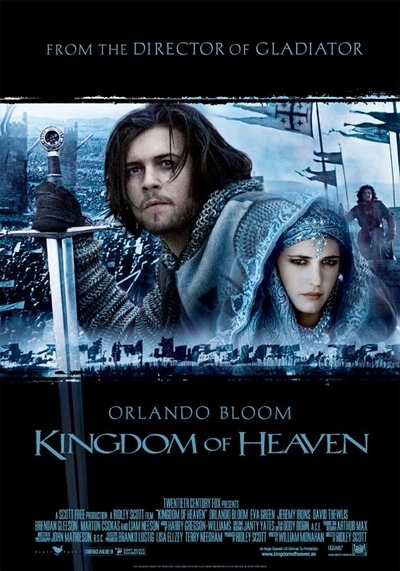 Story: Orlando Bloom stars as Balian, a blacksmith who has lost his family and nearly lost his faith. The religious wars raging in the far-off Holy Land seem remote to him, yet he is pulled into that immense drama. Amid the pageantry and intrigues of medieval Jerusalem he falls in love, grows into a leader, and ultimately uses all his courage and skill to defend the city against staggering odds. In Jerusalem at that moment - between the Second and Third Crusades - a fragile peace prevails, through the efforts of its enlightened Christian king, Baldwin IV, aided by his advisor Tiberias (Jeremy Irons), and the military restraint of the legendary Muslim leader Saladin (Ghassan Massoud). But Baldwin's days are numbered, and strains of fanaticism, greed, and jealousy among the Crusaders threaten to shatter the truce. King Baldwin's vision of peace - a "kingdom of heaven" - is shared by a handful of knights, including Godfrey of Ibelin, who swear to uphold it with their lives and honor. As Godfrey passes his sword to his son, he also passes on that sacred oath: to protect the helpless, safeguard the peace, and work toward harmony between religions and cultures, so that a kingdom of heaven can flourish on earth. Balian takes the sword and steps into history.